Thinking About Rescuing A Greyhound Dog? My Advice: Try Greyhound Fostering First! Fostering a greyhound (rather than adopting one) can be a great solution if you’re a pet lover who wants to make a difference in a dog’s life — but you’re not sure if you’re ready to adopt a greyhound just yet. If you know that you someday want to spend your life with a rescue greyhound dog, but you’re unable to make a 100% commitment to a pet at this time (for any number of reasons), then my advice is to consider fostering a greyhound dog — as opposed to full adoption. The truth is whether you’re young or old, greyhounds are great companions. And a greyhound dog can be your companion on a temporary basis, just as well as on a permanent basis. For example, if you’re retired then you probably want the freedom to more time with your children, or grandkids, or maybe even traveling overseas. But what if you would also like the affectionate presence of a dog in the house? There are lots of advantages to rescuing a greyhound dog. Greyhounds are particularly suitable for seniors — because they’re gentle, quiet, undemanding, and very unaggressive to humans. And, while many don’t believe this, they don’t need a large amount of exercise. The average greyhound is content with a couple of gentle walks (perhaps 30 minutes each time) every day. They do enjoy longer walks as well, and it’s a nice idea to take them for a real trek once a week, but on a daily basis they really don’t need much. Greyhounds as pets are generally easy-going, lazy dogs, and they’ll spend most of the time contently asleep whenever you’re not interacting with them. One thing to keep in mind is that greyhounds have tremendous appetites! Their hunger is such that they cannot control the urge to steal food whenever the opportunity presents itself — so it’s not wise to leave food of any kind unattended. There seems to be no variety of human food that greyhounds find obnoxious. While they are particularly fond of apples and fruit, they’re also tempted by cabbage, potatoes, pasta, tomatoes — really anything at all. You should resist the greyhound’s pleading as much as possible, and feed them recommended amounts of a good dog food, supplementing it with only healthy leftovers — such as fruit and vegetables — within reason. Greyhounds are generally able to distinguish small dogs from the species which they regard as prey, but they see no difference between cats and rabbits. They are bred and trained to chase down rabbits, and to give no mercy if they catch one. So your rescue greyhound should not be let off the lead without a muzzle anywhere cats and other small furry animals are likely to be. They can be trained to make an exception for a particular cat, but they usually present a danger for cats in general. Greyhounds make a lot of money for those who breed and train them. Once the dogs are past their best, they no longer have financial value and, unless they are rescued, they’re nearly always abandoned or put down. Fortunately, lots of greyhound rescue organizations exist throughout the country to help these gentle and intelligent dogs find permanent homes. 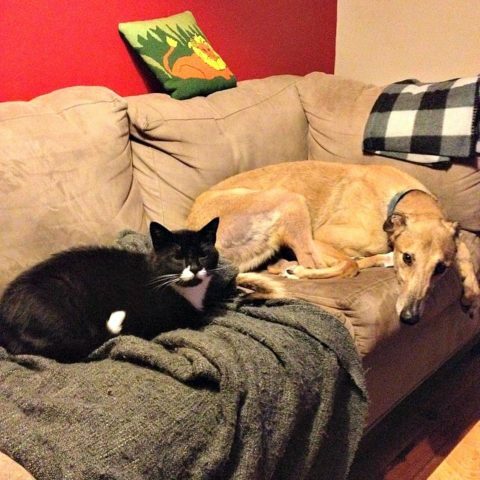 Fostering a greyhound relieves the pressure on kennel space for these rescue groups, and in that way helps them financially, while also giving a greyhound a temporary loving home where they can get used to fitting in with a human environment. Remember, most greyhounds have not experienced living in a house before. Fortunately, they learn very quickly. Greyhounds are rewarding and amusing animals with their own particular charm — which they use daily to repay the kindness of their foster owners. Is Greyhound Adoption Right For You?